Travel with Whaler to the bustling port city of Cartagena, Colombia, where two young boaters explore via Super Sport. As epic boating destinations go, Cartagena, Colombia, ranks high on the list. This South American port city is rich in natural beauty, eye-catching architecture and intriguing history—and it’s surrounded by water as far as the eye can see. We tagged along with two young boaters, Cartagenans Eliecer Ortiz and Eduardo Escalon, in their Super Sport for a tour of the area’s highlights. As locals like Eliecer and Eduardo are taught in school, Cartagena owes its roots to the shipping industry, having been developed in the 16th century as a waystation for Spain in the trade of gemstones and other treasures. The dangerous nature of transporting riches helps explain the extensive fortifications found on Cartagena’s shores, including high stone walls and large cannons once used to fend off attacks. The old walled city of Cartagena is rich with classic Spanish architecture. Today, the city has been designated a UNESCO World Heritage site and draws visitors from around the world. Behind those cannon-studded colonial walls lies a maze of cobbled alleys, balconies dripping with bougainvillea, and ornate churches casting welcome shade over sun-warmed plazas. Look closely and you’ll find beauty in the details, as well; for instance, the many door knockers carved into animal shapes, from sea horses and frogs to birds and lions. That so many 500-year-old fortresses, churches and monasteries remain intact is a testament to the skillful military and civil architecture of the Spanish and, fortunately, a great number of these sites are open to the public. Around the old walled city, Cartagena has emerged as a prosperous center of trade, with a glittering modern skyline and sprawling suburbs. Prominent corporations including Dole, SABMiller and Dow Chemical conduct major operations here, and a mass transit system, Transcaribe, began operation in 2015. Still, the area’s greatest attraction—the water—remains the focal point, and the best platform by which to explore. Conveniently for boaters, Boston Whaler dealership Todomar Marina is located in the tourist sector of Bocagrande, just minutes from historic downtown. The full-service facility offers repair and maintenance services, boat storage and more, all manned by a friendly staff. Eduardo points out that Todomar’s ship’s store sells hats and T-shirts, toys and snacks, electronics and fishing equipment—just about anything you might need for a Whaler adventure. Colorful and fashion-conscious, Bocagrande has often been compared to Florida’s Miami Beach. Beyond the chic art galleries and trendy boutiques, it’s home to popular restaurants serving delicious local fare. If you visit, be sure to sample a traditional bandeja paisa, a hearty platter of red beans, rice, plantains, avocado and ground meat. Naturally, there’s also an abundance of great seafood to enjoy; count on excellent ceviche and fresh red snapper. After filling up on arepas (stuffed, grilled corn-flour pockets) at nearby cafe Arepas Pues, Eliecer and Eduardo boarded their Super Sport and headed away from Todomar’s docks. A perk of boating here is that you can steer your Whaler in just about any direction and you’ll find something photo-worthy, beginning with an expanse of shimmering turquoise water. Until recently, an enormous statue of the Virgin Mary sat out in the middle of the harbor, watching over the surface and the ships that came and went. The statue was struck by lighting two years ago, shattering all but the base, but is still considered a symbol of protection for seafaring visitors. Just a hop, skip and a jump by Whaler, the beautiful Tierra Bomba Island sits at the mouth of the bay, with miles of shoreline, mango groves and the 250-year-old military forts of San Jose and San Fernando. Across the channel from Tierra Bomba, a second island, Baru, offers an idyllic contrast to the hustle-and-bustle of Cartagena. Its clean, white-sand beaches, lush vegetation and relatively affordable resorts make it an appealing getaway. With a Boston Whaler at your disposal, the San Bernardo Archipelago is another peaceful destination for weekend escapes. Cartagenans make the two-hour trip to Boquerón Island, Panda Island and others in search of the quiet beaches, crystal-clear water, extensive plant life and protected coral reefs that compose the archipelago. (Keep your eyes peeled for sea turtle sightings!) Beyond, the islands of Múcura and Tintipán mark a trail out into the vast Caribbean. 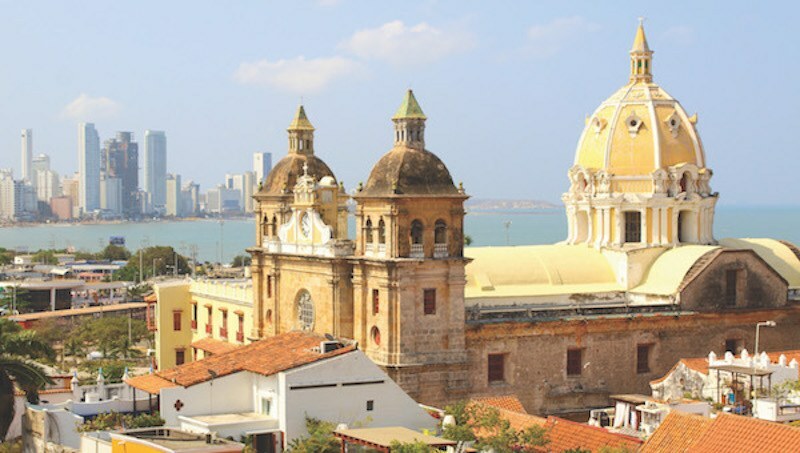 To be sure, Cartagena holds ample land-based charms, from the well-preserved structures of the Old City to a growing culinary scene and even a thriving nightlife. Still, there’s no question that its biggest selling point is the same one that drew Spanish explorers so many centuries ago: When you travel by boat, Cartagena holds endless riches.